What foods and crops do Amish farmers produce? Amish farmers are most likely to be involved in dairy farming. However there are a number of other crops and foods that Amish produce. Amish farmers have traditionally operated dairy farms. The typical Amish dairy will have from 30-60 cows. Amish use various types of technology to operate their farms. Most Amish allow tractors, but most do not allow them to be used in the field. Amish use the tractors’ engines to operate machinery around the barn. Most Amish require tractors to have steel wheels. A few groups of Amish do allow them to be driven in the field. 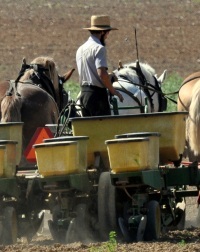 Amish farmers use a variety of technology. Amish in Lancaster County accept a wide range of technology, such as bulk cooling tanks, milk agitators, and even artificial insemination. In contrast, conservative Amish such as the Swartzentruber Amish prohibit use of such technologies, and are thus compelled to sell their milk as grade B, suitable for cheese but not drinking. Amish typically grow corn and hay to feed their animals, or may purchase feed if they do not have enough land to produce sufficient food for feeding purposes. A minority of Amish, typically those in Lancaster County and its daughter settlements, cultivate tobacco. Amish farmers in Lancaster face high land prices and the tobacco is valued as a cash crop by some. On the other hand, numerous Amish are against growing tobacco (as well as using it). New Order Amish are one group who have come out strongly against tobacco use and cultivation. Produce farming has grown in popularity in recent years. As land prices have increased, produce farming has become a viable option, as it requires relatively few acres. Produce farming of crops such as lettuce, tomatoes, brussel sprouts, peppers, broccoli, and other vegetables is common. Produce farming fits the Amish model well as it is particularly labor-intensive, providing work for Amish children and youth. The Amish practice of produce farming has been aided by the formation of produce auctions in places such as Mt. Hope in Holmes County, Ohio and New Holland in Lancaster County. Amish also participate in co-ops, which help provide markets for Amish produce. Poultry farming is popular among Amish, particularly in Midwestern states such as Ohio and Indiana. Amish raise chickens, turkeys, and ducks in long poultry barns, typically holding thousands of birds. 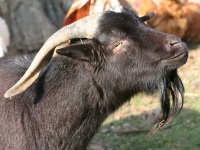 Goats and sheep are raised for their milk and meat in some cases by some Amish. Hog farming is also seen in some communities. A few Amish may raise beef cattle as well. Organic agriculture has become more popular among Amish in recent years. As Amish face high land prices, organic produce and milk production can offer a better return for an Amish farmer with a relatively small holding of land. Contrary to some beliefs, however, most Amish farms are not organic, with Amish farmers using a variety of fertilizers and chemicals to boost yields. Amish Online Encyclopedia: Do all Amish farm? 1 responses to What foods and crops do Amish farmers produce? Leave a reply to What foods and crops do Amish farmers produce?